An exhibition for the Smithsonian’s Cooper Hewitt National Design Museum on Governors Island, designed in collaboration with Project Projects, explores the most vibrant work in graphic design since 2000. 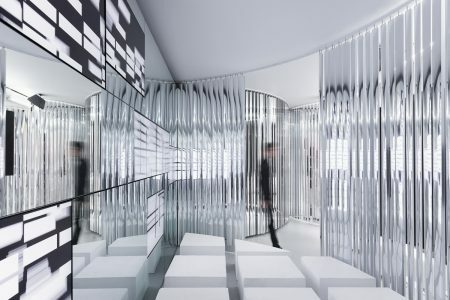 By covering the existing colonnade space with series of walls, Leong Leong was able to conceal the existing structure, create more display surface area, and organize the exhibition around each of the following eight themes: Posters, Magazines, Books, Information Design, Branding, Typography, Storefront, and Film and Television Titles. Voids in the system of walls cleared room for display fixtures and free-standing pieces.